Measurements: 4 1/4 inches long X approx. 5/8 inch wide. 115mm X 15mm wide. 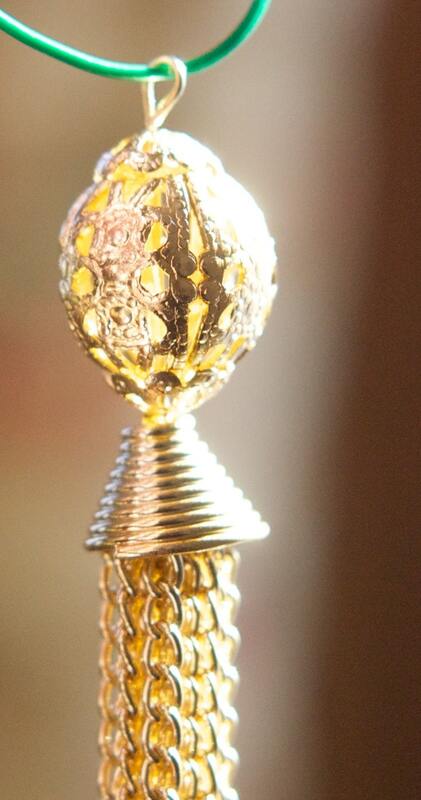 Characteristics: This long tassel has a filigree bead on top of the filigree bead cap. The chain pieces are over 2 3/4 inches long. Country of Origin: Made in Hong Kong. Additional Information: There are colors reflecting on this piece in the picture. In person these are gold tone, no other colors. As always, I am extremely happy with my purchases and supplies. Thank you guys for helping me create the perfect product for my customers. You know I will be back for more soon! fast shipping and looks just like the picture. Thanks so much!